"Adventure wanted. Will go anyplace, do anything. Box Thirteen." These words sent Dan Holiday, reporter turned author, into mystery and action for fifty-two episodes of Box Thirteen, a stand out radio program produced in 1948-49. Holiday, played by screen star Alan Ladd, checked his box at his paper, the Star-Times, each week and every single time launched himself into a brand new adventure. Mayfair Productions, Ladd's own radio syndication company, produced the program, one of the better mystery adventure shows of its era. The basic premise of the show is simple. Interested in writing the most successful and thrilling stories possible, Dan Holiday places an ad in the paper he works for - the Star-Times. Apparently prospering as a mystery writer, Holiday rarely charges a fee to any of the colorful clients that cross his path, most of whom need his assistance in one way or another. Working this incredibly produced series must have felt like old home week for Ladd; he had begun his acting career in 1935 at the Warner Brothers Studio-owned KFWB, working as many as 20 shows a week and, for a time, being heard as "The Richfield Reporter." Ladd also began appearing in several films, taking the small roles he could get. The part that would change Ladd's life forever and cement him as a movie tough guy came in 1942. Playing Raven, a conscientious murderer for hire, in 'This Gun For Hire.' This film and Ladd's part in it also changed the face of gangster movies forever. Alan Ladd proved that movie thugs could be handsome, smooth, and understated. "Box Thirteen" stood out amongst its contemporaries for more than one reason. Like many of his radio contemporaries, Dan Holiday had a secretary type. Suzy, played by actress Sylvia Picker, handled Holiday's correspondence and had the most unusual way of mangling the English language at least once every episode. Holiday also had the obligatory police contact, Lieutenant Kling as played by Edmond McDonald. Even with more trappings common to other shows, such as mysteries to solve, colorful bad guys, and plenty of fisticuffs and gunplay, Box Thirteen had a couple of characteristics marking it as different than other shows of its genre. The device Holiday uses to get his story ideas is one aspect of Box Thirteen that adds to its different flavor. Even though this technique, placing an ad in a paper advertising for adventure, was not a new one, actually present in at least one other old time radio show at the time, the way it was handled within this show was special. Holiday wasn't a retired cop or a super secret agent with no war to fight. He was a guy who wanted to live the stories he wrote about so he'd write better books. He had no intention of making money directly off of helping someone out of a jam or being locked away in an asylum or any of the other calamities he intentionally encountered over fifty-two episodes. His actions were purely mercenary in one sense, using his encounters as fodder for future best sellers, but another intent shone through in most shows. Even though he billed himself as a mystery or fiction writer in most shows, Holiday was just as much a human-interest type as anything. Thanks to Ladd's portrayal, Holiday used the want-ad gimmick to better the lives of those he came into contact with in this unique way whenever he could. 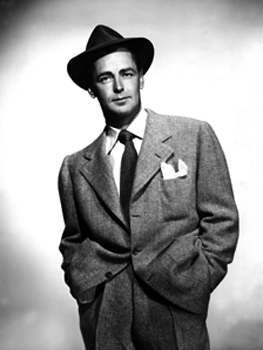 Some sources cite that Alan Ladd played Dan Holiday as somewhat stiff and wooden in the early episodes of Box Thirteen. By the last episodes in the series, however, all agree that Ladd made the character and the show itself what it was always intended to be - a showpiece for what Alan Ladd could really do. Hang on tight and read over Dan Holiday's shoulder as he reads what danger and death awaits him when he checks in at the Star-Times. All the mystery, suspense, and pure adventure you can handle await you in Box Thirteen, Volume 4, the last episodes in this classic program. This series is unique in that it has all the elements of a good Detective Show without the excessive violence so oftentimes associated with such radio shows. The excitement and danger is still there in each story and only made more interesting by the talents of Alan Ladd, other Actor's in the series and his staff of writer's making this particular show one of the best Detective shows during the Golden Age of Radio. From the first episode to the last, this series only seems to get better. And to my knowledge, the 4 Volumes available through Radio Archives comprise the complete set of programs written for this classic show from the Golden Age of Radio. The Radio Archives staff have again restored these original transcription discs to their original sound and tonal quality. Each Volume (of which there are 4) is adorned with unique artwork and includes heavy duty plastic cases with individual plastic sleeves for added protection of each CD.